...I'm grateful for Family Mealtime Prayersa welcome corrective to halfhearted table routines. The book is relentlessly Godward, with worship and thanksgiving reverberating throughout its pages. I warmly recommend it.' - Matt Smethurst, assistant editor, The Gospel Coalition Are you stuck in a rut, saying the same mealtime prayer day after day? Would you like to transform your mealtimes with meaningful Scripture prayersstarting today? You've picked up the right book Family Mealtime Prayers is a collection of prayers based on God's Word. It will equip parents to pray with confidence and teach their children biblical truth and godly character. 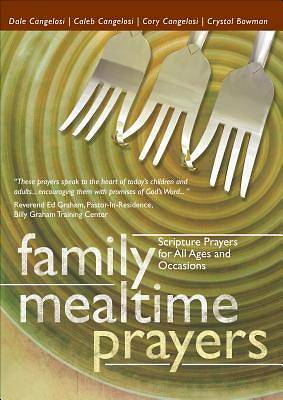 With prayers for adults, children, and holidays, Family Mealtime Prayers will enrich and energize your mealtime conversations, drawing the entire family into deeper relationships with the Lord and one another.